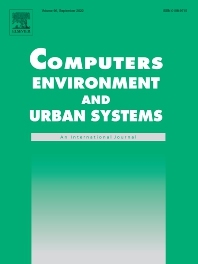 Computers, Environment and Urban Systems is an interdisciplinary journal publishing cutting-edge and innovative computer-based research on urban systems, systems of cities, and built and natural environments , that privileges the geospatial perspective. The journal provides a stimulating presentation of perspectives, research developments, overviews of important new technologies and uses of major computational, information-based, and visualization innovations. Applied and theoretical contributions demonstrate the scope of computer-based analysis fostering a better understanding of urban systems, the synergistic relationships between built and natural environments, their spatial scope and their dynamics. Application areas include infrastructure and facilities management, physical planning and urban design, land use and transportation, business and service planning, coupled human and natural systems, urban planning, socio-economic development, emergency response and hazards, and land and resource management. Examples of methodological approaches include decision support systems, geocomputation, spatial statistical analysis, complex systems and artificial intelligence, visual analytics and geovisualization, ubiquitous computing, and space-time simulation. Contributions emphasizing the development and enhancement of computer-based technologies for the analysis and modeling, policy formulation, planning, and management of environmental and urban systems that enhance sustainable futures are especially sought. The journal also encourages research on the modalities through which information and other computer-based technologies mold environmental and urban systems. Urban and regional planners and policy analysts, environmental planners, economic geographers, geospatial information scientists and technologists, regional scientists and policy makers, architectural designers.